Here at The Trenchless Team we enjoy everything Cherry Hill, NJ has to offer. A few of us actually live right in Cherry Hill. One thing we have noticed is that the average customer still does not know about trenchless sewer replacement. Most customers who call us out to do a sewer inspection expect to have their sewer system completely excavated or dug up. Here at, The trenchless team we do not encourage that and we don’t really offer excavation services. We are your no dig sewer repair experts. Once we are able to meet with a client and explain that there is new way of repairing their faulty sewer pipe every single customer wants it. Who could blame them? Typical sewer excavation repair can get very expensive very quickly once you factor in the cost to replace everything that the digging destroyed. We have seen customers have to replace their front porch, driveways and walkways. Well the good news is those days are long gone. 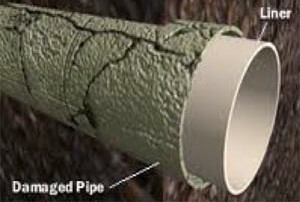 Trenchless pipe repair costs less and is normally completed in about a day’s time. Also, all of our pipe lining comes with a LIFETIME WARRANTY so why would you go anywhere else? Recently, we completed a sewer lining and when we went out to inspect the sewer the customer was experiencing sewage back ups in the downstairs basement. Sure enough the customer has a cracked, clay pipe as a result of tree roots. The tree was located directly in the front lawn and was a large shade tree. The customer was very upset that she thought she would have to chop down the tree. After the inspection we informed the customer that she would be keeping her tree! At the end of the day, we lined 90 feet of 4 inch sewer pipe. She was another pleasantly surprised resident of Cherry Hill, NJ. Our technology puts a new pipe inside the old pipe.